How do you get students to demonstrate their understanding through independent projects? Give them structure. The ICE-9 essential questions are applicable to any technology, and have guided student research on missiles, Legos and soccer. Watch video clips of what students had to say after experiencing the ICE-9 curriculum. Use the ICE-9 questions to research a technology. In the sample projects shown above, students (who had previously experienced the classroom curriculum) selected favorite activities and then analyzed them with the same approach taken in the classroom curriculum. From the content area of your class, demonstrate or present how some recent technology works. Explain how it extends a human's capability and what led up to it. Convey a story set in the future in which some present-day technology has changed for the better, enabling the main character to solve a problem. Convey a story set in the future in which some present-day technology has changed for the worse, causing a problem for the main character. Invent something that extends human capabilities. For example, play a game better or more easily, or sport, or communication, or travel faster/farther/more easily, play music better, cook better/more easily. Convince the class of the desirability of some technology within the content area of the class. Tell who invented it and why, within the historical context. Explain what people did before that technology was invented: was something else used or did people just not engage in that activity. 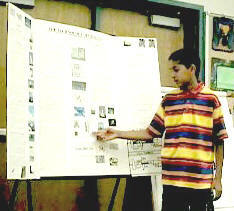 Present a timeline of inventions in a given field such as transportation, communication, sport, music, games, or food. For example, a timeline of pictures or a group of students in class act out use of invention. One made the other possible. Read the book Connections by James Burke and write about how one technology, such as radio, made another technology possible, such as television. Explain the reason for some invention by reading a biography of the inventor. Explain the historical setting for the invention, the inventor's job, interests, and motivation to create the invention. Read several biographies of inventors. Tell how the inventors were similar or different types of people and things that were particularly interesting about them. Tell what ways they were like yourself. What did they know to make the invention that you could also learn in school, or learn outside of school (e.g. leadership and motivation as sports team captain). Use MIQ list. Think of several items of technology and combine them to make a new invention. Choose one from each column. Devise a marketing campaign that explains a need the new invention fills, describes the target buyer, the proposed price, and how and where you will sell it. Make an ad poster and a storyboard for a TV commercial. Optional: present the poster or commercial to the class or prepare a video to show the class. Pick a certain type of invention and show a pattern in that invention such as wheels in transportation. Then, show a trend, such as wheels used for faster speed or specialized use, better materials. Pick something that was invented at one time, but was not developed until another time. For example, Leonardo da Vinci's helicopter or the flying wing. Explain what delayed the development, for instance, new materials technology, new control technology, political support, market demand, social acceptance, military needs, etc.